27th December 2018, the Serie A clash between Internazionale and Napoli at the San Siro finished with the hosts grabbing a late winner for a 1-0 victory. However, the high profile matchup between two Serie A contenders made news for all the wrong reasons. The game was marred with racist chants and rude gestures throughout, directed toward Napoli stalwart Kalidou Koulibaly. Speaking after the game the Gli Azzurrii manager Carlo Ancelotti expressed his dismay at what had transpired. 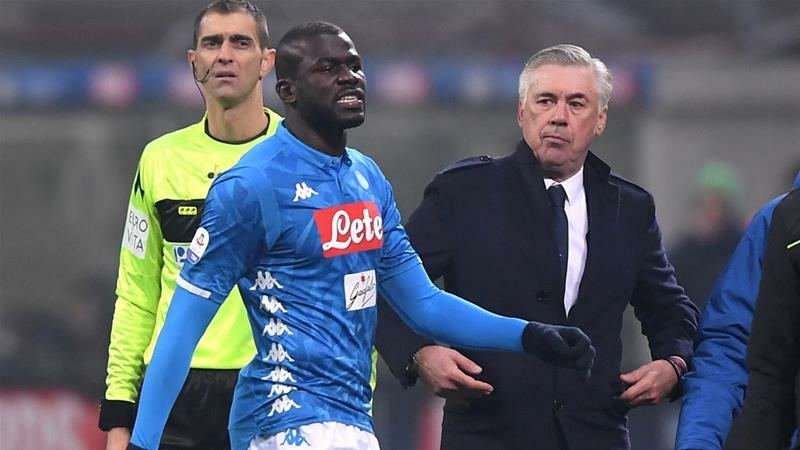 He said, “There was a strange atmosphere, as we asked three times for play to be suspended, they had announcements with the speaker three times.” Ancelotti claimed that Koulibaly’s sending-off was the result of the defender being highly aggravated by the shameful chants emanating from the crowd in Milan. “Koulibaly was certainly irritable. Usually, he is very calm and professional, but he was subjected to monkey noises throughout the game,” Ancelotti said. This is hardly the first time such behaviour has been witnessed in the Serie A nor is this the first time Koulibaly has suffered such treatment in the league. In October, Juventus were sanctioned for their fans’ behaviour towards the Senegalese defender. Koulibaly himself expressed disappointment at the incident but remained defiant in the face of the incident, sending across a strong message on Twitter. “I’m disappointed by the defeat, but above all at leaving my brothers,” Koulibaly said. Other footballers were quick to join in and support the Napoli defender, Inter captain Mauro Icardi condemned the fans’ behaviour and said he was disgusted at the abuse suffered by the defender at the hands of certain Nerazzurri supporters during the game. Ancelotti was right, such incidents leave Italian football worse off, such unsavoury atmosphere makes things very uncomfortable for the players involved. With players of African origin often unwilling to ply their trade in the league, moreover, such incidents tarnish the image of the country and its rich footballing and cultural heritage. 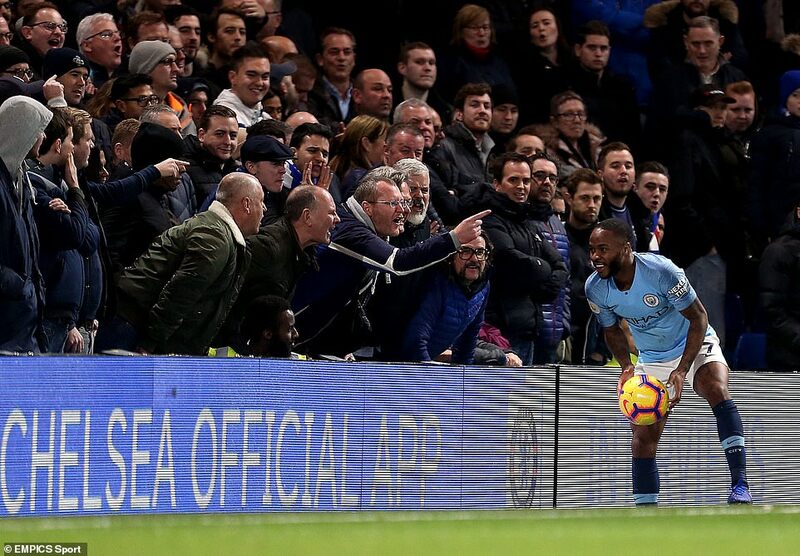 The Koulibaly incident came at the back of racist abuse that Raheem sterling suffered at a recent high octane match at Stamford Bridge. The Chelsea fans alleged to have hurled abuse at Sterling have been banned from the stadium. Chelsea have taken a firm stand against racism in the past few years, especially on the ongoing feud between Chelsea and Spurs fans. Chelsea manager Maurizio Sarri has also been vocal in calling for an end to Anti-Semetic chanting. Tottenham Hotspurs have a sizable proportion of Jewish fans which has resulted in blues’ fans crossing the line of banter to make rude anti-Semitic comments. Chelsea have taken strict action against such fans and are constantly working to prevent such uncouth behaviour. Spurs fans haven’t helped ease the tension with uncalled comments and usage of the Y-WORD. Law enforcement agencies have looked to put down a marker with arrests made after improper conduct at the North London derby where fans threw a banana peel at Arsenal forward Piere-Emerick Aubameyang. It has been a tumultuous time in English football off late and racial bias has been at the centre of the storm. It began with Sterling getting extreme criticism for his gun tattoo in the run-up to the world cup, with various media outlets claiming that it was his nod of approval towards gun violence in England and asking for his immediate exit from the England world cup squad. With pundits and players alike jumping to his defence, Raheem has remained calm and has transformed into a beacon of hope in this testing time. He has come out and said that it was his way of paying tribute to his father who died as a result of gun violence and that he had vowed never to involve himself with that. Sky Sports was forced to apologize to the Man City winger after misquoting his response on the aforementioned. Sterling’s outspokenness about the issue has been appreciated by the media and the football fraternity as a whole. The bias of popular tabloids that he has pointed out is often overlooked despite it being a constant trend in the English game. This almost subconscious bias that certain publications show, adversely effects the perception of the fans about black players. 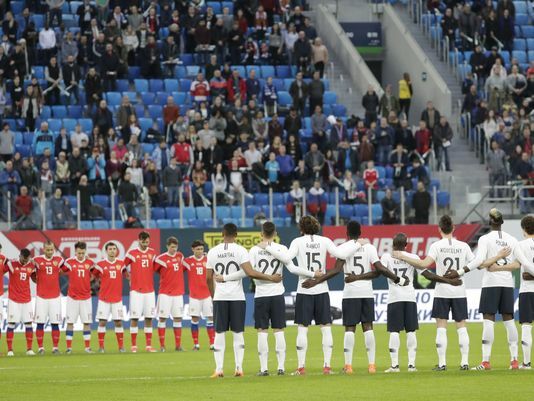 Racist abuse from Russian supporters during a ‘friendly’ between Russia and France in March raised serious doubts if Russia was equipped to handle the faction that was in store. Fans in the Saint Petersburg Stadium made monkey noises and yelled racist chants at black players including N’Golo Kante, Ousmane Dembele and Paul Pogba – all of whom were set to lead the line up for France at the World Cup in Russia in the coming months. CSKA Moscow fans chanting racist abuse at Arsenal’s black players several times during a Europa League match in April in Moscow immediately followed this up and made fans looking to travel to football’s premier showcase concerned for their safety. Danny Rose came out said he had asked his family not to travel to the world Cup, even though it was a once in a lifetime opportunity due to the fear of him and his family being racially abused. First, the referee can stop the play and request an announcement to insist that the discriminatory behaviour cease. Referees can then suspend the match until the behaviour from the fans stops after making a warning announcement about the same. Lastly, the referee can abandon the match if the behaviour persists. Off the field, FIFA’s Disciplinary Committee has the power to impose sanctions on football federations, clubs, officials, players and their representatives over incidents of code infractions, including discriminatory behaviour, as happened in the Russia-France friendly. 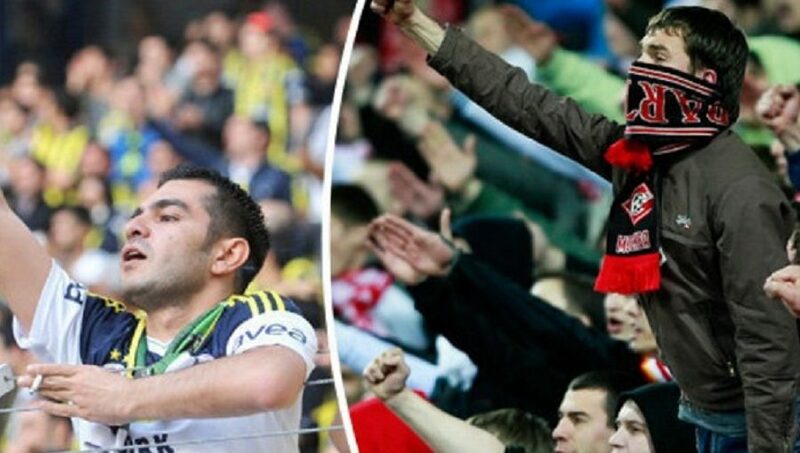 Offending fans can be banned from future matches. FIFA and Russian football union joined hands along with the people of Russia to give the world an event to be remembered for all the right reasons. Despite initial fears of racist conduct from fans during the world cup, fans and rights groups said the mood was different. Alexei Smertin, the Russian Football Union’s anti-discrimination inspector, said Russia had received positive feedback from visiting teams, fans and officials. 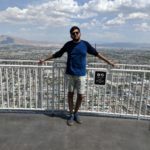 “Before the World Cup, there were a lot of fears on the part of foreign media, and we’re glad that after arriving here all the negative stereotypes were destroyed, everyone saw the diversity of Russia and our hospitality,” he said. There was another such incident that drew the attention of social media, an incident which helped unite the football community like never before. When a banana was pelted at Dani Alves as he charged to take a corner kick vs Villarreal in April 2014, the Brazilian remained unfazed and showed unparalleled spirit to defiantly pick up and eat the banana and produce a sublime assist from that very kick to seal a 3-2 win for Barcelona. This was quite a turning point in the fight against racism. The footballing community showed great solidarity to oppose such conduct. The banana challenge was taken up by football’s elite names like Aguero, Coutinho, and Neymar to stand against racism. It is sickening that even in this day and age the beautiful game is plagued by such unacceptable horrific behavior. However, the comradery showed by the players themselves was commendable. It shows the way to quash racism out of our game is to show solidarity and zero tolerance. The success at the world cup should be taken as a lesson in overcoming the prejudices and the joy that can be gained by coming together as one. The FA and its sister bodies should impose a similar zero tolerance policy. Building awareness is key in crushing out this problem; fans often do not possess the knowledge about the sensitivities of the issue and in most cases refrain from acting in such a manner when educated. After all, football is the beautiful game and there is nothing, more pleasing than a global family that cherishes its greatest sport in the right spirit.